Well, Zappman piqued my interest for getting TV show data from The Movie Database (TMDb). It turned out to be more work than I anticipated, and TMDb's limitation throws a spanner in the works for shows with very many seasons or episodes. But it works fine for most shows. Be aware, though, that TMDb is not as comprehensive as IMDb, especially for older shows. But you can still get a lot of good information. 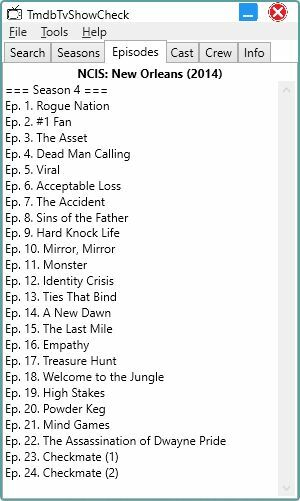 If you use EpisodeCheck, this program is a fast way of getting episode data that you can paste into EpisodeCheck. Read about it in the help file! And do read the help file! Gunnar's new program "TmdbTvShowCheck" is a great way to gather data "Cast, Crew and Episode List" for TV show profiles you are creating from scratch or to update an existing profile with missing information. Please, take the time to read the "TmdbTvShowCheck" help file. It will be worth the time it takes to read, and answer a lot of your questions. As always, please follow all Invelos rules when contributing new Profiles or updates to existing Profiles. Thanks to Gunnar for creating another great tool for use with DVD Profiler. Just tidied up handling of errors from TMDb, and fixed a misspelling. I screwed up so Ctrl-T didn't turn transparency on/off. Fixed in 1.0.2. It bothered me that TMDb wouldn't allow more than 40 calls to the API in 10 seconds, which caused problems with TV shows with many seasons or many episodes. After a few wrong turns I finally managed to circumvent that problem by keeping a timestamped log of all calls so I could see if we approached the limit, and if so, make a short pause in order to keep the next call outside the 10 seconds limitation. It's not 100% perfect, but it works fine enough for the most part. Sometimes it pauses a bit longer than one would think is necessary. And once in a blue moon it fails and gives you an error message. But that has only happened once during my extensive testing. As you can see, there is now a progress bar. And the round thingy turns orange when the program pauses as described above. Added ability to delete members. TmdbTvShowCheck can now work together with EpisodeCheck! Fixed an encoding problem that caused certain special characters to be imported incorrectly. Added two new features to make it easier when doing importing of a lot of TV shows in one session. See description under Tools menu in the new help file. First of all, let me explain the reason that I added season indicator and autocheck. I decided that I had all too many TV shows that lacked cast and crew, and I was primarily interested in cast. I had no intention to watch the credits for all TV episodes in my collection, so I was satisfied with adding data for my local database only. That left me with two possible sources for the data; IMDb or TMDb. IMDb is certainly more comprehensive than TMDb, so I first experimented with DJ Doena's Cast/Crew Edit 2, but while it works fine for adding data to a few TV shows, it became too complicated when trying to do them en masse. So I decided to go with TMDb (The Movie Database). I had already written TmdbTvShowCheck, so it seemed natural to use that, but I needed to tweak it in order to make it as useful as I could. Getting all cast from the Cast tab was just four clicks - right click for the context menu, select "Check all cast" and click, right click again, select "Copy checked cast" and click. Sounds simple, but clicking and moving the mouse time and time again also became tiresome. So I decided to implement AutoCheck. With that, all I had to do was select the Cast tab and then paste the result into DVD Profiler. And of course I did the same thing for Crew. I considered making format of the episode numbering configurable, but I decided to wait to see if anyone requested it. I do have some ideas for making it even easier to add cast and crew for multi season titles. Half season titles are trickier. Not sure how best to handle those. TmdbTvShowCheck now has support for both multi season and half season titles. But wait! There is more! You also get configurable episode headings in cast and crew. And I'm throwing in "Keep on top" as well! So don't hesitate - download the program right now! Be the first on your block to enjoy TmdbTvShowCheck 1.6! Found a couple of bugs in Crew handling, so I fixed those. Added automatic copy to the Check/Uncheck functions. 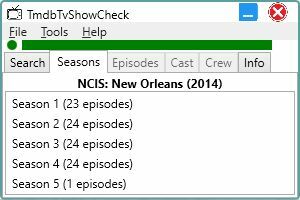 Added "Check/Uncheck all eps" for easier handling of half season titles. See help file. I don't expect to add any more features to this program. So except possible bug fixes, TmdbTvShowCheck 1.7 will probably be the final version. I wish I could do a similar program for IMDb, but unfortunately they don't provide an API. I'm not into screen scraping, and even if I was I wouldn't want to have to update my program every time IMDb changes something. ¹ "Buyer beware" may not be exactly appropriate, but I don't know latin for "freeware users beware"
Could you make it possible to copy text from the "Info Tab"? Sometimes, I see neat data/info on the "Info Tab" that I would like to paste into the overview of my local profile.